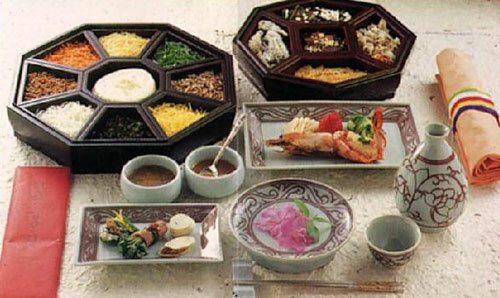 Gujeolpan is an elaborate dish consisting of nine different foods. In Korean, "gu" means "nine" and "jeol" and "pan" mean "section" and "plate"; thus the dish's name denotes nine foods assorted on a wooden plate divided into nine sections. With eight of the nine spaces on the sides and one in the center, the dish boasts a symmetrical beauty that is enough to take one's breath away. On top of that, the dish takes on the five traditional colors of Korean ancestors: yellow, blue, white, red, and black. Each of the eight spaces is laden with a distinct flavor in the colors. Normally used ingredients are julienned beef, mushrooms, cucumbers, carrots, separately-fried yellow and white parts of eggs, and bean sprouts, but variations of seafood, meat and vegetables are acceptable. The ninth space at the center is reserved for miljeonbyeong, small circular paper-thin wheat flatcakes. Eaten by wrapping the eight side dishes in the flatcakes and then dipping in the seasoned soy sauce for extra zest, Gujeolpan is a pleasure to the eyes and palate alike. It also provides well-rounded nutrition, being a source of multiple vitamins, protein, fat and carbohydrates. It has its origin in royal cuisine. The number 9 has a symbolical meaning. 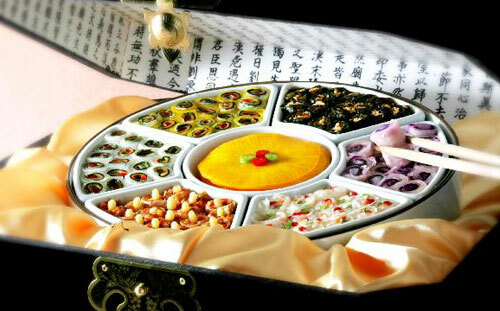 It represents wholesomeness and brings harmony, which is why gujeolpan is often served at official government banquets for domestic and international guests in a bid to promote harmony. The number's embedded meaning of fullness resonates in ancient Korean vocabulary as well. For example, the word "gujok" with the literal meaning of "nine tribes" stands for "the whole nation," and "guchun" literally meaning "nine skies" refers to "the whole universe." The royal palace was known as "gujung gunggweol"or "ninefold palace," and those with the highest ranks built houses with 99 rooms in ancient times. Today, this beautiful and healthy dish can usually be enjoyed in restaurants that specialize in royal cuisine, often in the Samcheong-dong area in downtown Seoul.